Born in Tebesaya, Ubud, 1942. He has been an orphan since he was a child and taken care of by his brother. In 1955, he graduated from elementary school adn later worke in Denpasar. Returning from Denpasar, he learned painting from I Wayan Turun for 3 years in 1954-1957. He later continued his painting lesson to Anak Agung Gde Dana in 1958. He joined in Purnama painterassociation in Peliatan and has held several exhibitions together with the association. At first, he painted Balinese daily live and various mythology stories as the object of his painting. In mind 1960s, he received commision to paints bird within natural landscapes. He then observed herons in Petulu area and illustrated them in his canvas. Eversince then, Sepi has been known as the painter of herons. 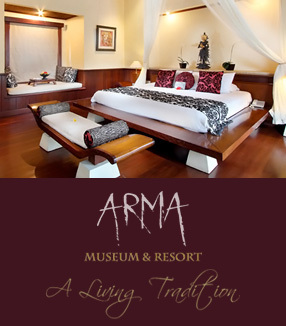 Sep's works have been collected by Neka Museum (Ubud), Museum Puri Lukisan (Ubud) and Arma Museum (Ubud). His works also have been displayed in various exhibitions in Jakarta, among them was the Santi Gallery's Satwa dalam Estetika. His works were also displayed in overseas exhibitions.